My memory of riding the S1000RR for a short while in Mumbai a couple of years ago is very vivid. I remember the motorcycle being fast and small but the electronics were heavy-handed and nasty. Accelerating away from a stop, the bike was phenomenal but traction control made the soundtrack sound like the engine was coming apart at the seams. In short, it was impressive but not something I'd want to add to my dream garage. 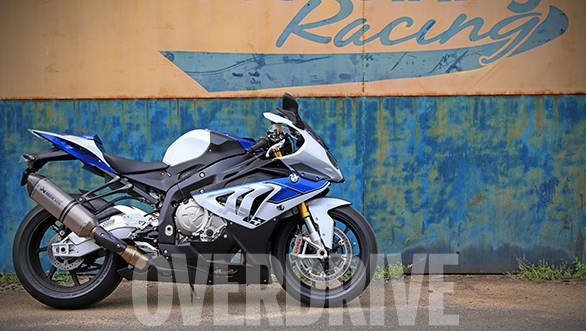 But BMW Motorrad has stormed the sportsbike world with the S1000RR, and they haven't launched it and sat back either. Within their product lines, the HP label (with Germanic precision, it stands for High Performance) identifies machines with extra performance. 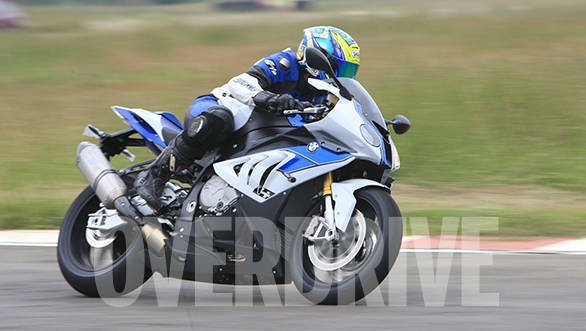 But the HP4 is the first time BMW has applied its go-faster know-how to their S1000RR. As you'll see they haven't held back at all and the result is a spectacular motorcycle that tempers its outrageous performance with a sweetness that makes the HP4 alarmingly easy to ride and therefore, startlingly easy to ride really fast. Yes, there will be electronics. BMW have to their credit a whole host of technology that they brought to motorcycles first. But in the case of the S1000RR, the story begins from the engine which is currently the lightest litre-four on the market. And it isn't a wilting lilly either, producing 193PS at 13,000rpm and 112Nm at 9,750rpm. But on the HP4, there's a lot of attendant technology and refinement that changes the nature of the power. For starters, the HP4 is quite happy to let you use full power in all of the modes  mud, gravel and snow. Of course I am kidding. The modes are rain, sport, race and slick. Yes, that's a full-on 200PS motorcycle that's happy to leave full power on even if it's pouring outside. What BMW have done is worked on the actual power delivery between 2,500 and 8,000rpm to make it smoother. In the other modes, they've raised the torque output between 6,000rpm and the torque peak. Yes, the Germans do have a sense of humour and it's their sense of proportion that we should be questioning. But that is the thing about electronics, it makes insanity palatable and in this case, fully useable. So if you shift into slick mode (if you're at a track and using slick tyres), holding the ignition button pressed for a bit activates launch control. BMW says you can virtually have the throttle rolled all the way to the stop and use the clutch to modulate power while the electronics work out how to limit torque so you can accelerate as hard as possible without flipping yourself into the middle of the next week. The launch control also inhibits wheelies and limits revs until you cross 60kmph or gain a lean angle greater than 25 degrees. A quickshifter is standard so the fuel input and spark is both cut for a fraction of a second when you're upshifting and the bike also has Race ABS  with four modes. In the normal modes, ABS activates a gentle pressure on the rear brake which BMW says makes for tremendous stability under braking while permitting ultra-short stopping distances. In race mode though, it deactivates the rear brake ABS so you can lock up the rear wheel if you're skilled enough to gain an advantage from that. You can, similarly, mess with the traction control setting in slick mode to control how big a slide the system will permit you. Of course, this being an HP also means less weight. BMW have managed to shave the dry weight to 169kg, adding lightweight wheels (2.5kg saved) and a standard titanium exhaust that saves another 4.5kg. And when you ride you cannot tell if any of these things are on or off. Yes, that's not a bug it is a feature. The biggest advance on the HP4 and the big difference from the inputs that came from the German sportsbike championship where the HP4 was developed was finesse. Finesse in how smoothly and sweetly all these electronic systems work to control the flow of power to the rear wheel. If they hadn't left an annoying red light on the dash that blinks when traction controls turns tomfoolery into thrust, you simply wouldn't know when it came or not. Now this particular machine is brand-new and hence restricted to 9,000rpm. And I'm told I have a very smooth, progressive throttle hand. And still, I seem to have that silly light blinking away to glory everywhere on the Chennai track. 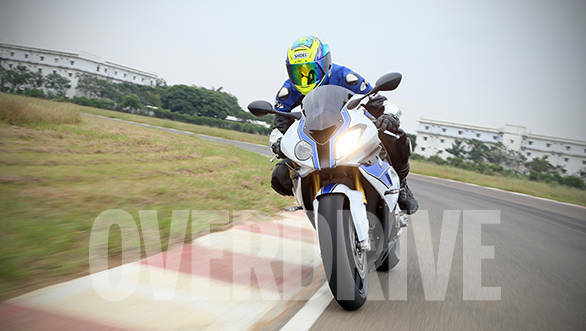 That's the kind of intense power the HP4 makes. It is the unintrusive nature of the traction control that makes it such an easy bike to hop on and go fast on. But despite this long list of impressive  and clearly effective  technology, the true innovation that the HP4 brings hasn't even made a stage appearance so far. First, a hint of history. The HP4 is, in effect, a homologation special so that BMW can bring this computer with engine and wheels to the World Superbikes. Which is why all of them, including this one, gets a laser engraved serial number (you're looking at 2405) on the top triple clamp. This one belongs to Bharath Reddy of British Nutritions Pvt Ltd who happens to like all his bikes in full track-prep featuring one of his company's brands. We've just managed to intercept the HP4 before it turns into a full-on track demon. Back to the HP4 then. The big technological leap it brings, as opposed to the refining of other technology, is innocuously called DDC. That's Dynamic Damping Control. 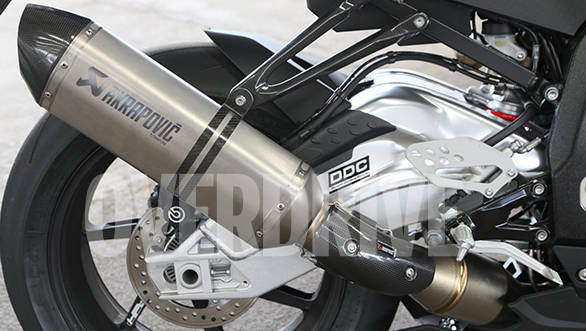 The HP4 has, in effect, semi-active suspension with control over both compression and rebound damping. The system has sensors that measure shock travel, is linked to the riding mode and also gets lean angle data from the "Sensor Box" to determine what might be the best damping setup for the given riding condition. But what if it doesn't know how you like your bike? Well you can soften or stiffen the setup (seven steps each) through a menu on the dash. Preload, though, you'll need a wrench for. In rain and sport modes  both street-oriented  the HP4 sets itself up for comfort. Stick in race mode  like I did at Chennai  and the damping is stiffer. However, running as hard as I dare in the bumpy turn one, the BMW doesn't feel as stiff as it did a moment ago as I braked under the big arch. Maybe I'm connecting dots in hindsight rather than with my amazing riding skills, but the point is that you can clearly feel the difference as the bike adjusts the damping upto a thousand times a second to ensure the tyres stay as firmly in touch with tarmac as possible. Clear meters have a huge role since many of the incredible array of settings are done through it. The beauty of all this isn't explaining all this to slack-jawed friends in pit lane. The wonderful part of all this technology is that it makes the HP4 an easy motorcycle to get along with. Leaving pit lane for the first time, by turn four I'm already turning in as hard as I dare on a borrowed Rs 34 lakh (ex-showroom) motorcycle and by the end of the first lap, I'm annoyed at being limited to 9,000rpm. Never have I found this much confidence in a 200PS motorcycle this easily and in this short a time. Riding a full-on litre bike at a racetrack is hard work. There's quite a bit of muscle involved. Whether it is the matter of holding on for dear life under acceleration, or turning the motorcycle into the corner with forearms stinging from the pain of the incredible braking these things are now capable of. All the electronics of the HP4 ensure that when exhaustion kicks in and you start making mistakes, the system smoothly cuts in and prevents your idiocy from ending in tears. As in BMW have gone and done it. They've invented the invisible safety net.